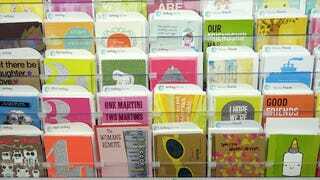 Things aren’t going great for the greeting-card business, and it’s probably the Internet’s fault. Ain’t it always? NPR reports that Hallmark recently closed a distribution center, laying off 570 employees. The company has cut its payroll from 22,000 to 10,500 in five years. It’s not a coincidence: “I would say that the personal expressions industry is facing something, kind of like climate change shift, where things aren’t going to go back to the golden age that they were in the ‘80s,” said onetime designer Maria Brenny. Now that there’s Facebook for birthday wishes and Instagram for throwback photos in honor of Mother’s Day, it’s harder to get big bucks for paper cards. But it’s not totally hopeless, because hey, people love die-cut hand-stamped cards made of recycled copies of The Velveteen Rabbit, right? In a Kansas City coffee shop, Danny Wong is plunking change into an old, refurbished candy bar machine, and fishing out greeting cards. Easy, Tiger is the little startup that makes these cards, with financial backing from Hallmark. Too bad there’s no category of greeting card for “sorry the Internet ate your business model, good luck finding another one,” because sadly, those might do a brisk business.